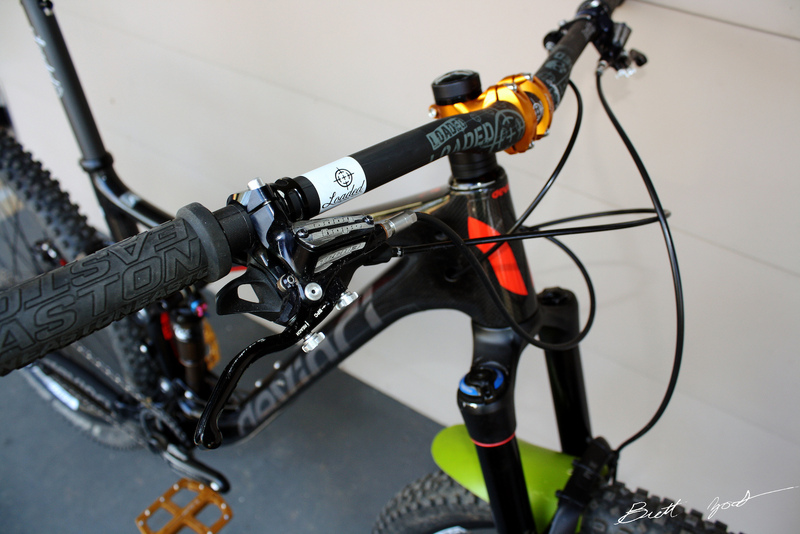 First of all this is a review for Loaded's Carbon version of the AmXc bars. When I first received these bars I was impressed with the packaging. Loaded takes a bit of time to package their products so they are protected stylishly. These are my second set of carbon bars and the are competitively light at 219 Grams on my food scale. I had got these bars because for the local trails, my previous bars felt too wide at 780mm. I was constantly hitting the bar ends on the singletrack. My local trails have lots of narrow passages between trees. The 760mm width instantly felt at home while on the trail and in my hands. They have a 15mm rise, a 6 degree up sweep and a 9 degree back sweep, which felt good and comfortable right fro the get-go. I have bent 2 aluminum bars in the past, so I wanted to make sure that m carbon bars are good and strong. So far in the five to 6 months I have had them, they are holding up great. I have taken many spills on my trailbike to give them a good test. One of the things I really like about them is that Loaded has made rough areas where the stem and your grips go. This has helped keep everything in place to help keep you from over tightening these parts and damaging the bars. The styling is the only reason I took of any of the stars. I believe some will love it and some not as much. I like it myself, but the design is a bit different, but somewhat subtle at the same time. I would not hesitate to buy these again. Miscellaneous Loaded has an arsenal of handlebars to handle any terrain and the AmXc is designed for any trail. This All Mountain and Cross Country bar is lightweight and tough giving you the edge you need to ride any terrain. These bars are 710mm wide, and have increment markings to taper the bars to your specific fit and width preferences.